Learn the traditional canal craft of Roses and Castles painting at London Canal Museum with artist Tricia Parrott. The courses are for all ability levels and aimed primarily at adults. The picture shows some work completed by participants in a previous course with no previous experience. Tricia Parrott is a professional signwriter who learned the craft in Braunston boatyard in the early 1970s, and you will learn the true Northamptonshire style. Narrow boat painting is just one aspect of the age-old craft of decorative, or 'folk' painting, practised world-wide by those who would not describe themselves as artists, but who have the desire to create things of beauty. In art, each artist develops his or her own method, preferred subjects, colours, layout, brush strokes, etc.. In craft painting these things are generally dictated by tradition, although, once a certain standard of proficiency has been achieved, most people like to incorporate their own individual ideas within that tradition. The most popular elements of narrow boat livery, roses and castles, can be used to decorate a variety of things, from traditional water cans and dippers to small gift items and even furniture. Jumble sales and junk stalls are great places to find things to renovate and decorate. What's included in the charge: Paint, brushes, paper and plastic materials for practice, admission to the museum, tea/coffee at intervals during the course. 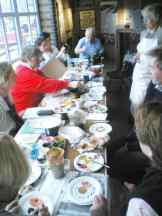 Participants can either bring an object which they would like to paint and take away with them, or else boards suitable for painting will be available to participants to buy at an additional charge of £1. The boards are approximately 8" square. 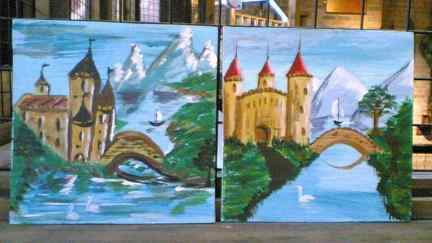 If you wish to bring your own objects to paint, make sure you have one thing large enough to paint a castle on -a tray or box-lid for example. These should be thoroughly cleaned and painted in water-based paint, in a dark colour. Apart from this, all you need to bring is your enthusiasm! Send a cheque at least two weeks in advance payable to Canal Museum Trust to us at London Canal Museum, 12-13 New Wharf Road, London N1 9RT. Be sure to include your full name and address and preferably telephone and e-mail contact information. If you do this, it is possible that the workshop may be full when your cheque arrives, in which case it will be returned. Make a booking in person at the museum during opening hours.We accept cash, cheques and major credit cards.